Arbuscular mycorrhizal (AM) root colonization was studied in a long-term field trial in which four farming systems currently in use in Switzerland were continuously applied to a randomized set of plots at a single field site from 1978 till 1993. There were two low-input farming systems (organic and bio-dynamic) and two high-input (conventional) farming systems (according to Swiss guidelines of integrated plant production with and without farmyard manure). The systems had an identical 7-year crop rotation and tillage scheme and differed essentially only in the amount and type of fertilizer supplied and in plant protection management. The percentage of root colonization by AM fungi was determined in field samples 2–3 times over the growing season in crops in the rotation, namely in winter wheat (Triticum aestivum L. cv. Sardona), vetch-rye and grass-clover. We found the percentage of root length colonized by AM fungi to be 30–60% higher (P≤0.05) in the plants grown in soils from the low-input farming systems than in those grown in conventionally farmed soils. 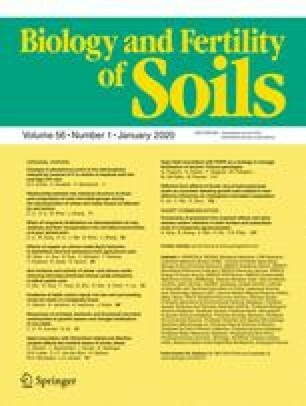 Approximately 50% of the variation of AM root colonization was explained by chemical properties of the soils (pH, soluble P and K, exchangeable Mg), the effect of soluble soil P being most pronounced. The potential of the field soils from the differently managed plots to cause symbiosis with AM fungi was tested in a glasshouse experiment, using wheat as a host plant. Soils from the low-input farming systems had a greatly enhanced capacity to initiate AM symbiosis. The relative differences in this capacity remained similar when propagules of the AM fungus Glomus mosseae were experimentally added to the soils, although overall root colonization by AM fungi was 2.8 times higher.